The petroleum system with Jurassic source rocks is an important part of the hydrocarbons discovered in the Middle East. Limited studies have been done on the Jurassic intervals in the 26,500 km2 Abadan Plain in south-west Iran, mainly due to the deep burial and a limited number of wells that reach the basal Jurassic successions. The goal of this study was to evaluate the Jurassic organic-rich intervals and shale gas play in the Darquain field using organic geochemistry, organic petrography, biomarker analysis, and basin modelling methods. This study showed that organic-rich zones present in the Jurassic intervals of Darquain field could be sources of conventional and unconventional gas reserves. The organic matter content of samples from the organic-rich zones corresponds to medium-to-high-sulphur kerogen Type II-S marine origin. The biomarker characteristics of organic-rich zones indicate carbonate source rocks that contain marine organic matter. The biomarker results also suggest a marine environment with reducing conditions for the source rocks. 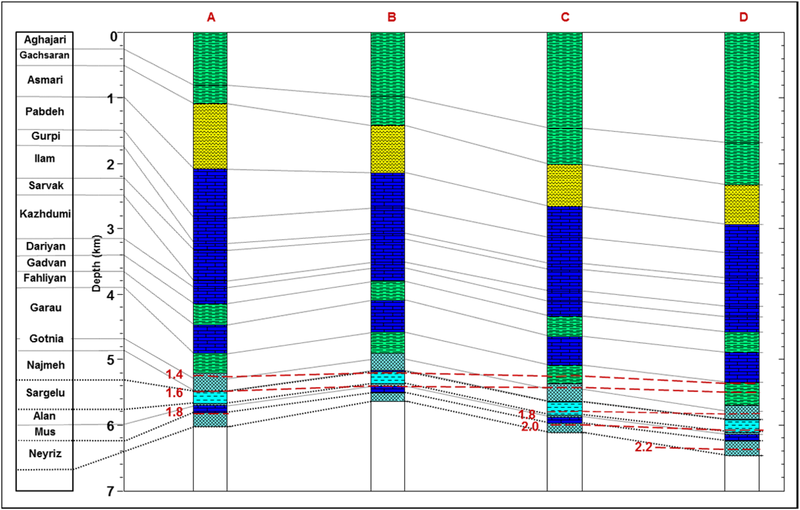 The constructed thermal model for four pseudo-wells indicates that, in the kitchen area of the Jurassic gas reserve, methane has been generated in the Sargelu and Neyriz source rocks from Early Cretaceous to recent times and the transformation ratio of organic matter is more than 97%. These organic-rich zones with high initial total organic carbon (TOC) are in the gas maturity stage [1.5–2.2% vitrinite reflectance in oil (Ro)] and could be good unconventional gas reserves and gas source rocks. The model also indicates that there is a huge quantity of retained gas within the Jurassic organic-rich intervals. The Late Jurassic intervals are source rocks of 14 petroleum systems in the world. These contain a fourth of the discovered hydrocarbon. In addition, the Early and Middle Jurassic strata are sources of a significant amount of petroleum (Klemme 1994). The Jurassic source rocks are sources of hydrocarbon for the Jurassic–Tertiary reservoirs in the Mesopotamian Basin (Abdula 2015; Abeed et al. 2011; Alsharhan et al. 2014; Pitman et al. 2004). Moreover, they may have unconventional shale oil and shale gas in areas which are within oil and gas windows, respectively (Aqrawi and Badics 2015). These source rocks include the Bajocian–Bathonian Sargelu and Callovian–Oxfordian Najmeh Formations, which extend in the Zagros Fold Belt and Mesopotamian Basin (Al-Ameri et al. 2009; Aqrawi and Badics 2015; Bordenave and Hegre 2010; English et al. 2015; Sachsenhofer et al. 2015). 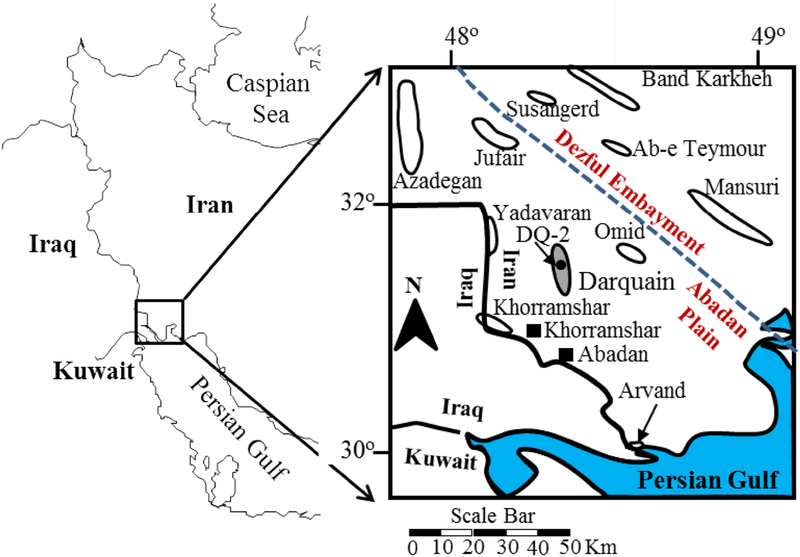 In the Abadan Plain, there are several giant oil and gas fields within the Jurassic and Cretaceous carbonates, such as Darquain, Azadegan, Jufair, and Yadavaran fields (Fig. 1). In the Darquain field, there are gas accumulations in the Sargelu and Najmeh Formations underlying the Gotnia cap rock in the Jurassic petroleum system (Fig. 2). Oil accumulated below the Gadvan cap rock in the Fahliyan reservoir in the Early Cretaceous petroleum system. In the Abadan Plain, which has an aerial extension of 26,500 km2 (Alizadeh et al. 2016), the source rocks are Jurassic–Early Cretaceous in age (Bolandi et al. 2015; Zeinalzadeh and Sajjadian 2010). However, only limited studies have been carried out on the Jurassic strata (Zeinalzadeh et al. 2015; Zeinalzadeh and Sajjadian 2010). This is mainly due to the deep burial and a limited number of wells that reach the basal Jurassic intervals. The source rocks of the Darquain field have been investigated by Zeinalzadeh and Sajjadian (2010). The Rock–Eval pyrolysis of samples from the Jurassic strata from the deepest well in the area (5,703 m-deep Well Darquain 2) indicated that there is an excellent organic-rich zone in the upper part of the Sargelu Formation. The elemental analysis and organic petrography carried out in this work allowed a higher resolution of the Jurassic organic-rich sediment description of the Darquain field and the determination of the kerogen type of organic-rich zones. The rock samples were analysed using gas chromatography (GC) and gas chromatography–mass spectrometry (GC–MS) to investigate depositional environments, and the origin and type of the organic matter in organic-rich sediments. Zeinalzadeh et al. (2015) revealed that the Jurassic source rocks are in the gas maturity stage, and the oil generation phase passed before the Cenozoic era. Basin modelling in this study was used to investigate that shale gas plays in the Jurassic strata, calculate organic porosity, and evaluate methane generation and retention through the geological time within the organic-rich zones. The results of this study can improve that our understanding of the Jurassic shale gas plays of the Darquain field. They can be used as a guide to understand that the similar shale gas plays in the Jurassic strata of Abadan Plain. This would be very important for oil companies that want to invest in the area, because no detailed study has been carried out on the deep-sited Jurassic intervals. The Abadan Plain is surrounded by the Dezful Embayment, the Persian Gulf, and the Iran–Iraq border. The Abadan Plain was a passive continental margin from the Mesozoic to Cenozoic periods (Piryaei et al. 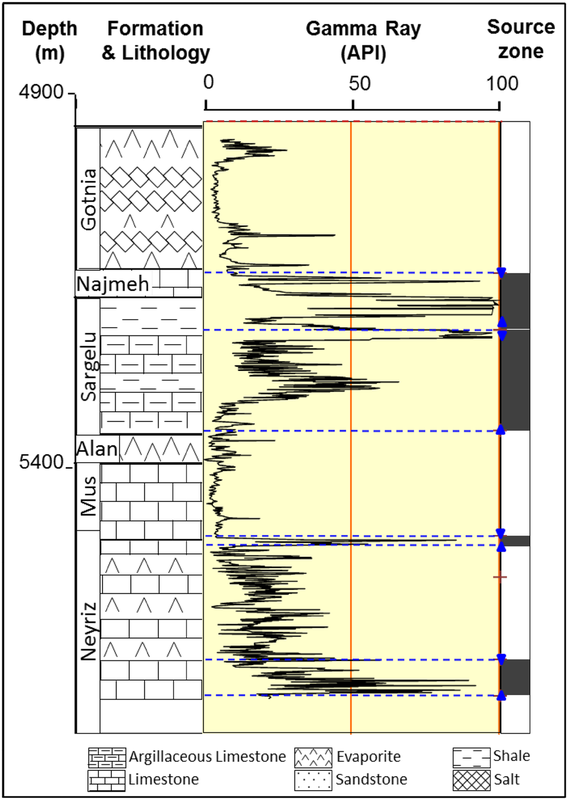 2011) and ended as a foredeep basin during the Neogene period (Navabpour and Barrier 2012; Pirouz et al. 2011). The Cretaceous basement tectonic activity formed anticlines with the north–south trend in this area (Fig. 1), and was slightly reactivated during the Zagros Orogeny in the Late Cenozoic era (Abdollahie Fard et al. 2006; Soleimany and Sàbat 2010). During the Middle–Late Jurassic period, there was shallow-water carbonate shoal on the north-eastern edge of the Arabian Platform with limited water circulation between the intra-shelf basins, which extended over the Arabian Platform and South Tethys (Bordenave and Hegre 2010). The anoxic conditions led to the deposition of organic-rich sediments in the depression (Bordenave and Hegre 2010; James and Wynd 1965). In the study area, the Early Jurassic interval (Neyriz and Mus Formations) consists predominantly of anhydrite and limestone with thin shale layers. The Middle Jurassic succession (Sargelu Formation) is mainly composed of black argillaceous limestone and shale deposited in south-west Iran, Iraq, and Kuwait (Aqrawi and Badics 2015). The Sargelu Formation is often rich in organic matter, isolated by the Early and Late Jurassic evaporitic layers. The Late Jurassic layers (Najmeh and Gotnia Formations) unconformably overlie the Sargelu Formation. The Najmeh Formation consists of oolitic limestone with coarse dolomite crystals and organic-rich layers. The Gotnia Formation is composed of anhydrite and salt with organic-rich shale layers (Fig. 3). The Middle and Late Jurassic strata have been identified as the main source rocks in Iraq and Kuwait (Derks et al. 2012; English et al. 2015). They are also considered to be unconventional gas and oil reservoirs (Aqrawi and Badics 2015; Rasouli et al. 2015; Schenk et al. 2015). Since the Jurassic layers in DQ-2 well were drilled with oil-base mud, the cuttings were contaminated with oil. In addition, microscopic observations showed that the samples contained variable amounts pyrobitumen. Therefore, in the preparation phase, the samples were washed using a mixture of dichloromethane and methanol solvents. Three organic-rich samples were selected for elemental analysis. This method was carried out to determine the kerogen types of the organic matter content of the samples (Durand and Nicaise 1980). The samples were pulverized and extracted to eliminate bitumen before kerogen separation. The kerogen was isolated for an elemental analysis of the extracted samples using the Kerogenatron apparatus of Vinci Technologies. Elemental composition was determined on a Carlo Erba EA 1108 instrument. The petrographic observations and vitrinite reflectance measurements were done using standard reflected light microscopy (Lietz MPV-SP) at the Research Institute of Petroleum Industry (RIPI). Chips of two rock samples of the Sargelu source rock were set into epoxy resin blocks. The blocks were polished after hardening, and the light reflected by the organic matter on a polished surface was measured by a photometer. Four cutting samples from organic-rich strata were selected for bitumen extraction, and compositional and biomarker analyses. Bitumen was extracted from rock samples and fractioned to saturated, aromatics, and resins. Then, GC and GC–MS were used to study concentration ratios and the biomarkers of organic-rich strata. Bitumen was extracted from powdered rock samples in a Soxhlet apparatus for 48–72 h according to the RIPI standard laboratory method. The bitumen in the rock powder was washed with chloroform. Then, in another container, chloroform was evaporated (at boiling temperature of 60 °C). After distillation, the chloroform returned into the washing cycle. To remove the elemental sulphur, small amounts of activated copper powder were added to the chloroform. Then, using the IP-143 method and heptane as a solvent, the asphaltenes were precipitated from the extracts. 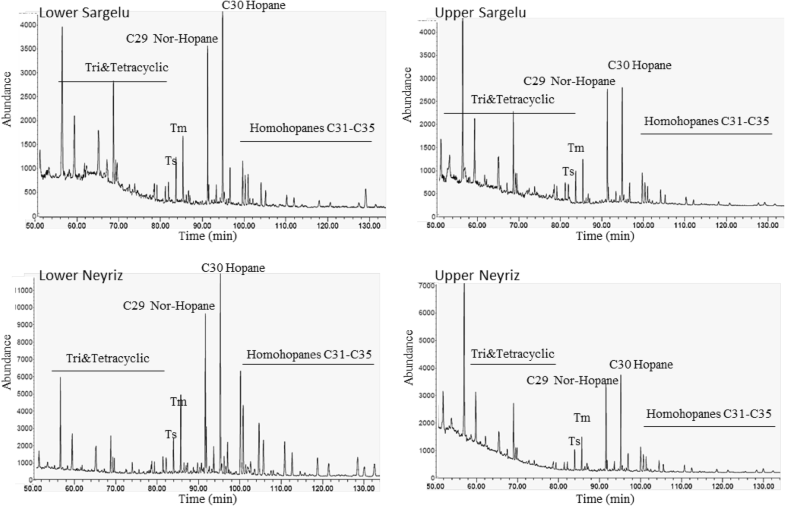 Next, the extracts were fractionated into saturated, aromatic hydrocarbons, and NSO compounds by column chromatography (Mozaffari et al. 2015, 2017). The saturated fractions were dissolved in n-hexane and analysed by GC. The GC was a Thermo Quest 2000 model with DB-5 capillary column (30 m × 0.25 mm i.d.) and helium as a carrier gas. The GC oven temperature was programmed to increase from 150 to 280 °C at a rate of 3°C/min followed by an isothermal period of 40 min. The Thermo Quest 2000 Gas Chromatograph was equipped to separate the biomarkers, which were transferred to a Thermo Finnegan mass spectrometry at 230 °C. Selected ion monitoring (SIM) was applied to detect the steranes (m/z 217) and triterpanes (m/z 191) in aliphatic fractions. The individual components were identified on the basis of a comparison of their mass spectra and retention times with reference compounds and literature data (Bordenave 1993; Peters and Moldowan 1993; Peters et al. 2005). Basin modelling software programs Temis Flow and Genex, developed by the French Institute of Petroleum (IFP), were used to model gas generation from the source rocks. Four hypothetical wells were built from depth structure maps of the kitchen area of the Jurassic gas reserve. Lithological information, the geological ages of the strata, and the geothermal gradient (27 °C/km) were extrapolated from geological well reports. Based on the geological time scale of Walker et al. (2013), the absolute ages were designated. The burial histories of four hypothetical wells were reconstructed from depth structure maps based on the identified formation tops on seismic sections and well data, and the mass of the generated hydrocarbon was obtained. The Easy %Ro kinetic model was used to calculate vitrinite reflectance (Sweeney and Burnham 1990). Kerogen Type II-S properties of the Temis Flow data base was used because of the similarities of kerogen type of Jurassic Darquain sediments with that of US Monterey Formation. In addition, since the Jurassic intervals of the Darquain Field are under high pressure and temperature regimes, the open hydrocarbon system defined by Vandenbroucke et al. (1999) and the Langmuir isotherms (Langmuir 1916) in the Temis Flow software were used to calculate the mass of hydrocarbon generation and retention in the source rocks. The organic-rich zones in the Sargelu and Neyriz Formations were defined as the source rock in the basin modelling software. The thickness of the Upper Sargelu zone is 76 m and has a 6.5% residual TOC, and for Lower Neyriz zone, these are 58 m and 2.1% TOC (Zeinalzadeh et al. 2015; Zeinalzadeh and Sajjadian 2010). Initial TOC values of the source rocks in past geological time were calculated using the method of Peters et al. (2005). The HI of immature or early-mature organic matter of the Sargelu Formation in High Zagros was estimated to be about 464–693 mg/TOC (Rasouli et al. 2015). Assuming an initial HI of 660 mg/g TOC for both source rocks, an initial organic carbon of 14% and 4% was calculated for the Upper Sargelu and Lower Neyriz zones, respectively. Based on elemental analyses, kinetic data of the Type II-S kerogen from the Monterey Shale (Lewan and Ruble 2002) were used to calculate the hydrocarbon generation from source rocks in this study. The elemental analysis results (Table 1) show that the sulphur/carbon ratio (S/C) in the Lower Sargelu zone is above 0.04% allows the classification of these kerogens as high-sulphur (Lewan and Ruble 2002; Orr 1986). Kerogens of the Upper Neyriz and Upper Sargelu zones are medium-sulphur (Lewan and Ruble 2002; Orr 1986). Microscopic examinations were done on two polished specimens of the Upper Sargelu zone. The petrographic observations of organic matter indicate abundant amorphous marine kerogen; still, pyrobitumen, vitrinite, and inertinite macerals were found in the samples (Fig. 4). In addition, high sulphur content (6–9.6%) (Table 1) indicates the presence of oil-prone Type II-S kerogen. This conclusion is in line with the study by Alizadeh et al. 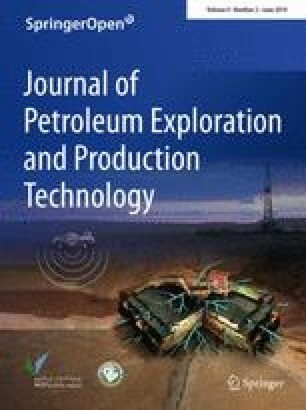 (2016), who analysed some crude oil samples from the Early Cretaceous to Eocene reservoirs in the Abadan Plain using GC and GC–MS, and concluded that oils were derived from Kerogen Type II-S of a marine carbonate lithology. Similar conclusions were reported by English et al. (2015), Aqrawi and Badics (2015), Sachsenhofer et al. (2015), and Al-Ameri et al. 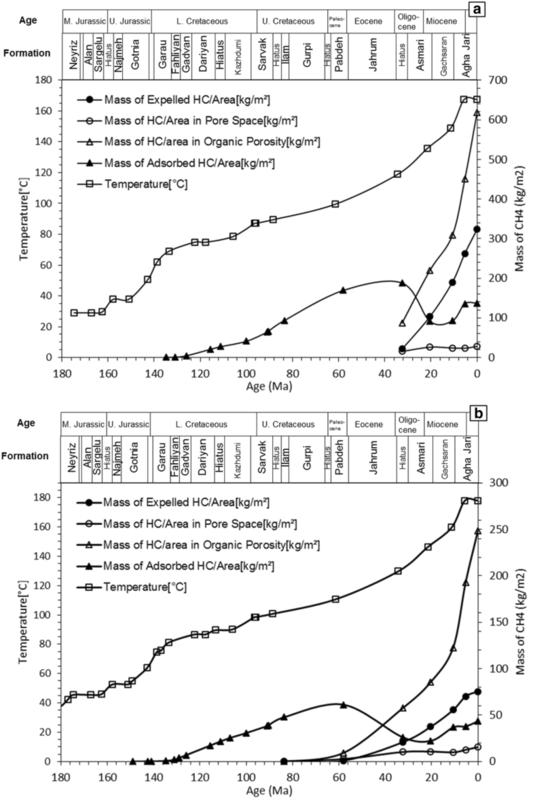 (2014) for organic matter of Sargelu Formation in Iraq and Abdullah (2001) and Kaufman et al. (2002) in Kuwait. Type II-S kerogen supports organic matter derived from marine phytoplankton with high potential of hydrocarbon generation. Sulphur-rich kerogen undergoes thermal degradation at lower temperatures than any type-II kerogens (Peters and Cassa 1994; Tomić et al. 1995). The organic matter richness of these zones is due to anoxic conditions during deposition and preservation. The relative proportions of saturated, aromatic fractions and polar compounds of the extracts of the rock samples were calculated. 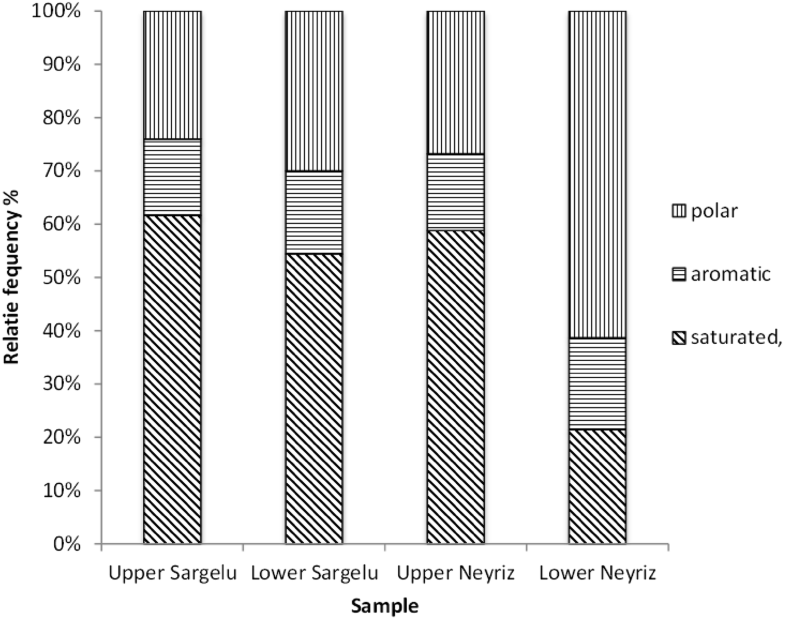 The samples from the Sargelu and Upper Neyriz zones contain similar amounts of fractions. Their saturated and polar components are around 54.4–61.6% and 24–30%, respectively (Table 2). Aromatic fractions range from 14.4 to 15.6% (Table 2; Fig. 5). However, the Lower Neyriz zone contains relatively high amounts of polar component (61.3%) and saturated and aromatic fractions of 21.4% and 17.3%, respectively (Fig. 5). The chemical composition of bitumen extracts depends on the parent organic matter and thermal maturity (Tissot and Welte 1984). 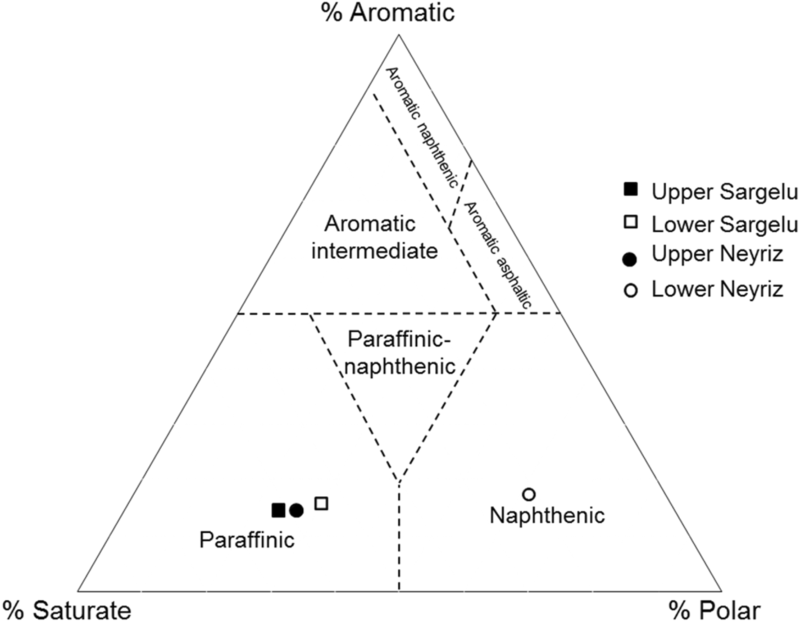 The chemical quality of the organic matter within the rock samples was obtained from the fractional amounts of polar, saturated, and aromatic compounds, which were plotted on a classification triangular diagram of hydrocarbons (Tissot and Welte 1984) (Fig. 6). The distribution of fractional compounds indicates that the chemical composition of organic matter in the Upper Neyriz and Sargelu zones is paraffinic. Organic matter compounds of the Lower Neyriz have naphthenic hydrocarbon properties. The depositional environmental conditions of the organic-rich strata were studied through the use of n-alkanes and isoprenoids (Volkman and Maxwell 1986), which was obtained by gas chromatography. The pristane/phytane ratios (Pr/Ph) can be used to identify the paleoenvironmental conditions and lithology of the organic-rich zones (Hunt 1996). The pristane and phytane are formed from phytol in oxic and reducing environments, respectively. Therefore, the Pr/Ph ratio is more than 1 in oxic environments, while it is less than 1 in anoxic environments (Powell and Mckirdy 1973). The Pr/Ph values of the studied rock samples are in the range of 0.38 and 0.65 (Table 2), which represents the reduced sedimentary environment at the time of the organic matter deposition. 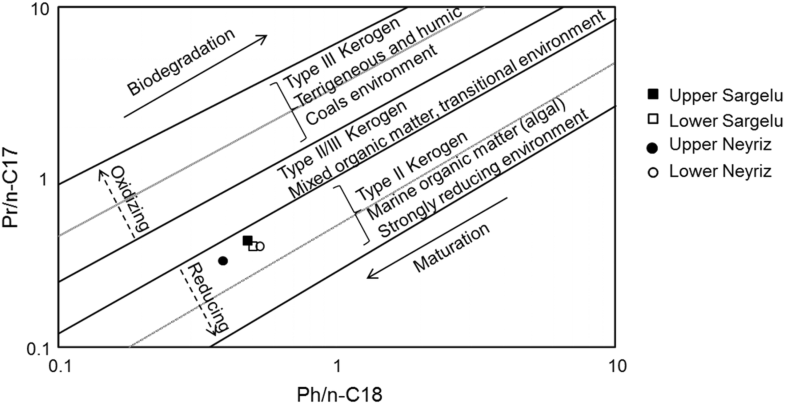 The diagram of the parameter pristane Pr/n-C17 vs. phytane Ph/n-C18 (Shanmugam 1985) represents type-II kerogen, which originated from marine organic matter, such as algae, which was deposited in a strongly reducing environment (Fig. 7). The quality of hydrocarbon generated from organic matter inherits their characteristics. Therefore, the origin and type of organic matter are important parameters in geochemical studies. The biomarker detection index of all cutting samples in the graph of Pr/n-C17 vs. Ph/n-C18 (Mathur et al. 1988) represents the lithology of carbonate and marine environment of the organic-rich zones (Fig. 8). The distribution of terpane biomarkers (Waples and Machihara 1991) of rock samples was studied using GC-MS and by monitoring the ions m/z 191 (Fig. 9). Their parameters were calculated (Table 2). The m/z 191 mass fragmentograms of the studied samples show high proportions of hopanes relative to homohopanes and tricyclic terpanes (Fig. 9). 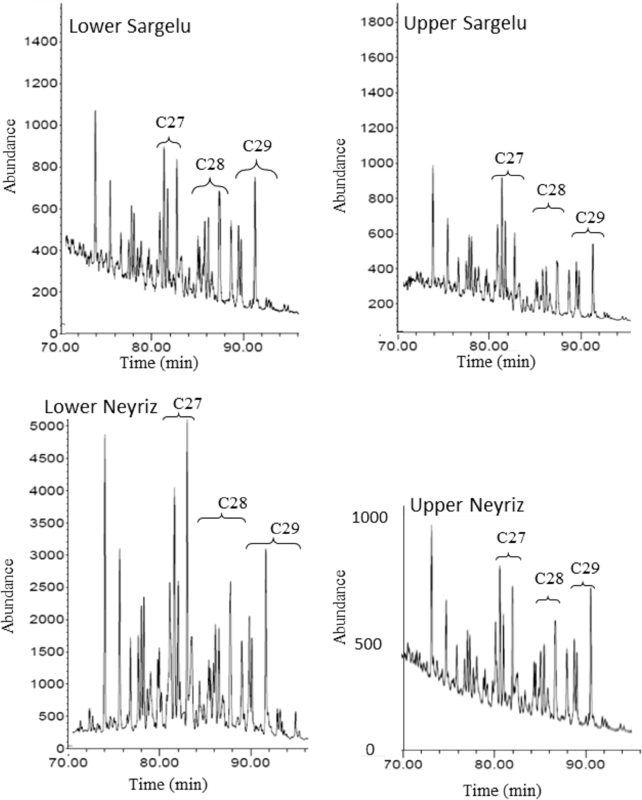 The sterane and diasterane distributions (C27, C28, and C29 steranes) were characterized by the m/z 217 ion chromatograms and are shown in Fig. 10 and Table 2, which can be used to indicate the origin of the organic matter input (Huang and Meinschein 1979; Waples and Machihara 1991). The sterane parameter values of the rock samples are plotted on a triangular diagram (Huang and Meinschein 1979) (Fig. 11). The values suggest that the organic matter of the organic-rich zones is from algae organisms and marine environments. This conclusion is consistent with the reported sedimentary environment conditions of Sargelu Formation in north Iraq (Abdula 2015; El Kammar et al. 2015; Fatah and Mohialdeen 2016). The thermal models built for the four pseudo-wells (Wells A, B, C, and D) (Fig. 12). 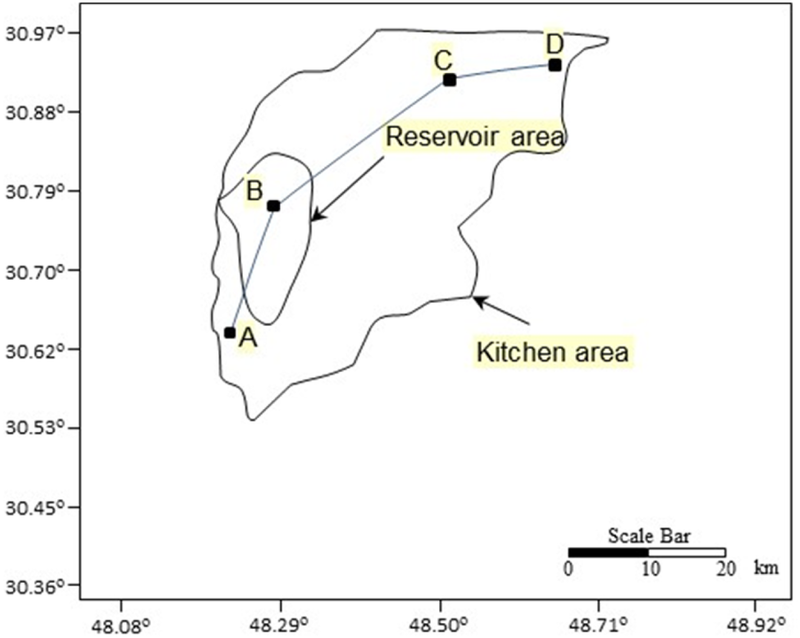 Well B is located at top of the Darquain anticline, where the source rocks are in shallower burial depth in the kitchen area (Fig. 13). The basin model was calibrated against organic maturity data. Vitrinite reflectance measurement is a commonly used thermal maturity indicator of organic matter. It gives a more reliable indication of maturation levels compared with other methods (Magoon and Dow 1994; Tissot and Welte 1984). Based on reflectance data, the mean vitrinite reflectance measurements of the samples from a depth of 5160 m and 5175 m are 1.3 and 1.5%Ro, respectively. This indicates maturity of the gas generation stage for the Sargelu Formation. Additional support for these results was the measured vitrinite reflectance of the Jurassic samples by Zeinalzadeh et al. (2015), which indicates that the Jurassic organic-rich zones are in the gas-maturity stage (1.22–1.4%Ro). The C29 sterane ratios—the biomarker maturity parameters—increase with increasing thermal maturity (Peters et al. 2005). The extracted bitumen of rock samples have C29 S/(S + R) and C29 ββ/(ββ + αα) sterane ratios in the range of 0.49–0.57 and 0.40–0.45, respectively (Table 2). 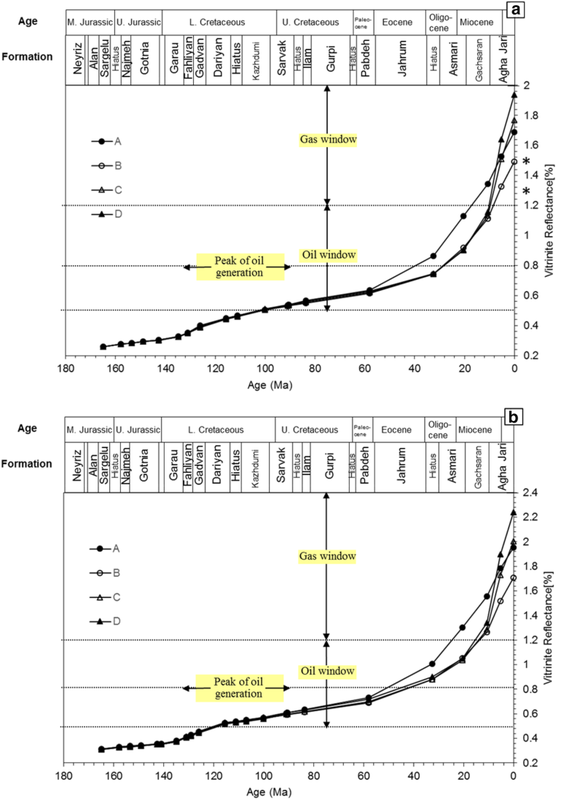 This shows that the organic matters have passed the peak-oil-generation stage and are at the late maturity stage (Fig. 14). Thermal modelling indicates that the organic matter of the Sargelu and Neyriz source rocks in Well B is at the gas-maturity stage (1.5–1.7%Ro). This figure is consistent with that obtained by organic petrography for the Upper Sargelu samples (1.3–1.5%Ro) (Fig. 15). However, the source rocks are in a depth interval of 5140 m and 5703 m, and the measured temperature was in the range of 165–176 °C. The Sargelu Formation is in oil generation stage in Burgan field, Kuwait, in burial depth of 3403–3454 m (Abdullah 2001; Alsharhan et al. 2014) also it is in oil window in Rumaila field, south Iraq, and a depth of 4550 m (Abeed et al. 2013). Organic matter of the Sargelu Formation is immature to post mature in north Iraq (Abdula 2015). The burial depth of the Jurassic strata increases from Well B towards the flank of the anticline and, consequently, the thermal maturity of the organic matter reaches up to 1.9%Ro in Sargelu and 2.2%Ro in the Neyriz source zones in Well D (Figs. 13, 15). Therefore, it can be concluded that the organic-rich zones lie in the gas window over the kitchen area of the Jurassic reserve. 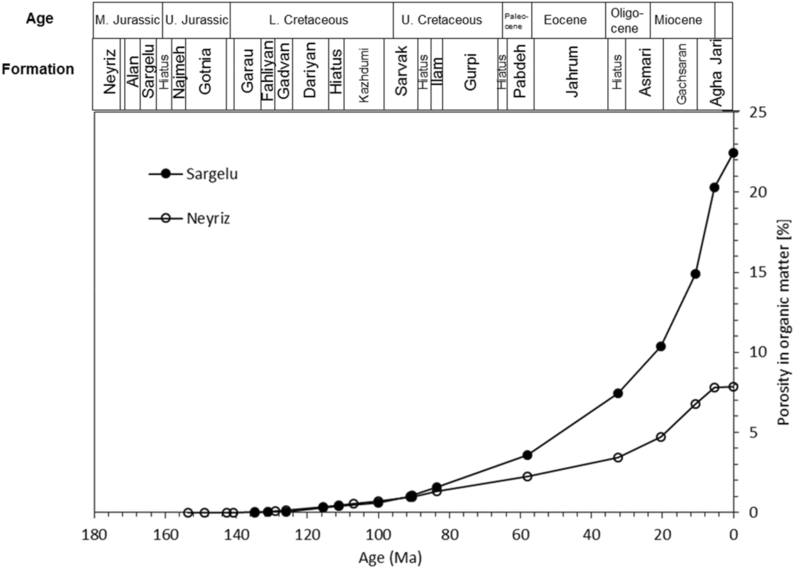 Modelling shows the similar maturity history for the Sargelu and Neyriz source rocks in the studied wells (Fig. 15). The maturity trend of the source rocks is the same until the Late Cretaceous period when the maturity history in Well A increased with greater values compared with the other wells. 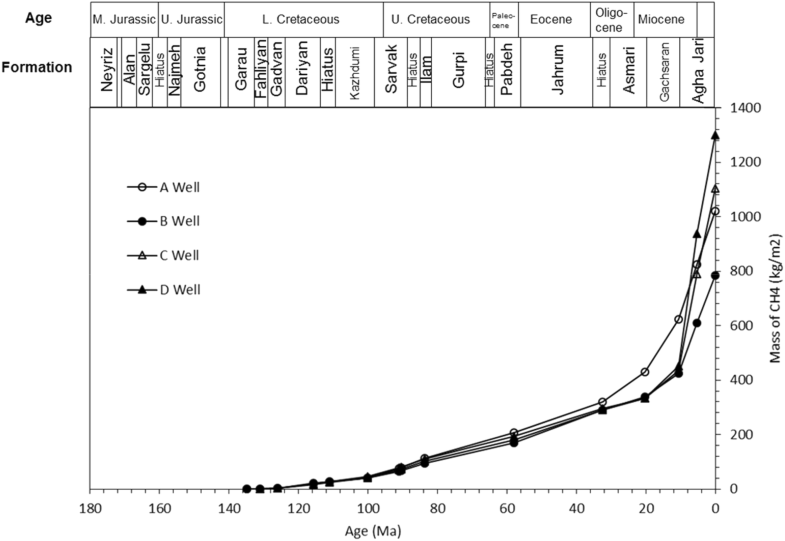 In addition, there was a shift in the maturity trends of Wells D and C during the Miocene time (Fig. 15). These deviations in maturity histories can be related to different sedimentation rates, and consequently, varied thicknesses of sedimentary layers over the study area during the Late Cretaceous and Neogene tectonic activities (Fig. 15). Intra-particle organic porosity is created in organic matter when a part of these is converted into hydrocarbons. The in-situ hydrocarbon can be stored in organic porosity. In addition, gas-phase molecules can be adsorbed to the surface of solid organic carbon. Therefore, an organic-rich zone could be both a source and a reservoir (Romero-Sarmiento et al. 2013). The TOC content and thermal maturity are the primary controlling factors for the gas generation and reserve capacities of the organic-rich zone (Gasparik et al. 2014; Romero-Sarmiento et al. 2013; Zhang et al. 2012). Based on basin modelling results, the source rocks in the kitchen area of the Jurassic gas reserve are in the gas generation stage. The transformation ratio of organic matter is over 97%. In this study, initial organic porosity was considered to be 0% in immature organic matter. It was increased during thermal maturation through time and reached up to about 22% and 7% in the organic matter of the Upper Sargelu and Lower Neyriz zones, respectively, in Well B (Fig. 16). The mass of in-situ methane in the Sargelu and Neyriz source zones was obtained using Langmuir’s law (Fig. 17). Methane has been generated in the source zones from Early Cretaceous (about 130 Ma ago) to recent times in Well B. The mass of adsorbed methane increased up to 188 kg/m2 in 119 °C 33 Ma ago in the Sargelu and 61 kg/m2 in 110 °C 58 Ma ago in the Neyriz source zones. Then, the methane moved out of organic porosity to the pore space of rocks in temperatures greater than 119 °C in the Sargelu and 110 °C in the Neyriz source zones. The methane adsorption capacity and volume decreased at temperatures between 119 and 135 °C in the Sargelu and 110 °C and 146 °C in the Neyriz source zones (Fig. 17). A similar trend is described in the Barnett Shale in Texas (USA) (Romero-Sarmiento et al. 2013). Figure 17 also shows that an important part of methane generation and adsorption occurred during the oil window between 100 Ma and 25 Ma ago. The Jurassic gas reserve of the Darquain field has abnormal pressure up to 11,261 psi (unpublished well geological report) and in temperatures of about 168 °C. Some parts of the oil generated inside Sargelu and Neyriz could be cracked in-situ into pyrobitumen and gas, as reported in some parts of the Zagros region (Bordenave 2014). Thermal cracking of oil and conversion of solid kerogen to hydrocarbons can result in an increase in fluid volume and abnormal pressure (Guo et al. 2016; Wang et al. 2016). The retained methane in the Upper Sargelu zone of Well B is 784 kg/m2, which is about 70% of the total generated methane mass (Fig. 18). In Well D, about 80% of the generated methane is retained (1299 kg/m2) in the source rock (Fig. 18). The amount of methane generated in the Neyriz source zone of well B is 391 kg/m2, from which about 75 kg/m2 was expelled (Fig. 17). According to the results, the Sargelu and Neyriz organic-rich zones could be the source of the explored Middle and Late Jurassic gas resources and important amount of gas retained within these intervals as unconventional reserve. The petrographic observations of organic matter indicate abundant amorphous marine kerogen in the Sargelu source rock. The biomarker parameters, pristane Pr/n-C17 and phytane Ph/n-C18, of the samples from Sargelu and Neyriz represent marine carbonate organic-rich zones deposited under anoxic conditions. 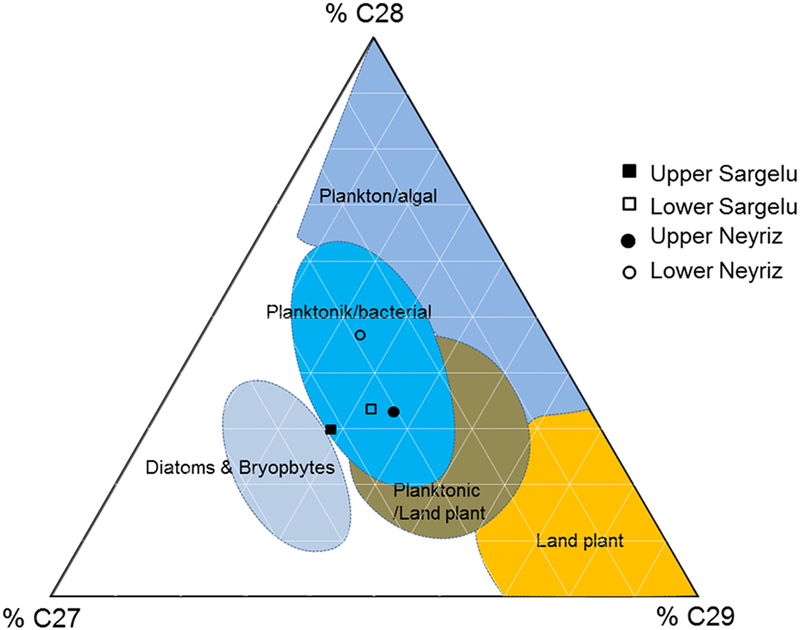 In addition, the C27, C28, and C29 steranes indicate that the organic matters in the Jurassic source zones mainly originated from marine organisms. According to elemental analysis, the source zones contain mainly medium-to-high-sulphur kerogen Type II-S. The distribution of fractional compounds indicates that the chemical compositions of organic matter in the Sargelu and Upper Neyriz zones are paraffinic and have naphthenic hydrocarbon properties in the Lower Neyriz. Modelling shows shifts in the maturity history of source zones over the study area during the Late Cretaceous and Miocene time which can be related to different sedimentation rates synchronic with the Late Cretaceous and Neogene tectonic activities. The thermal model shows that the source rocks have been generating methane from Early Cretaceous to the present day. The Sargelu and Neyriz zones are in gas generation stage over the kitchen area of the Jurassic reserve, and the organic-rich zones have favourable characteristics, such as porosity and thermal maturity for shale gas play in the Darquain field. The Sargelu and Neyriz organic-rich zones could be the source of the explored Middle and Late Jurassic gas resources in the Darquain field. In addition, there is a high possibility that an important amount of gas retained within Jurassic organic-rich intervals is an unconventional reserve. The authors would like to extend their thanks to the Ferdowsi University of Mashhad for financial support of the Project no 27749.